WannabeHappy Ransowmare is a malicious piece of software that should not be running on your PC under any circumstances. It is critical to remove it without any hesitation if it happens to be already active on your computer. Do not hesitate to do so, because this devious program exhibits extremely malicious functionality. Like any other ransomware application, it can lock large quantities of your files without any notification or authorization. It should be quite obvious that having this intrusive program active on your PC could have devastating outcomes, to put it lightly. In our article, we provide further information in regards to this malicious program's functionality. Additionally, we include a few virtual security recommendations, which should allow you to maintain a fully secure operating system at all times. Besides all the information, we also include a detailed removal guide that you should remove WannabeHappy Ransowmare once and for all. During the initial analysis, malware researchers working at our internal labs have noticed that the basic functionality of WannabeHappy Ransowmare does not differ all that much for other programs of this category. As soon as it gains full access to your operating system, it immediately starts doing its dirty work. First, it scans your hard drive for its contents. Right after that is done the ransomware application launches the encryption procedure, which is completely silent. Due to such nature of this malware, users are usually blindsided by it. What is fortunate is that this malware does not affect any files that are essential for your operating system's functionality. However, you cannot manually decrypt any affected files since the ransomware in question uses a robust cipher to lock them. Right after the encryption procedure, you will notice a warning message, which will inform you about what has happened. 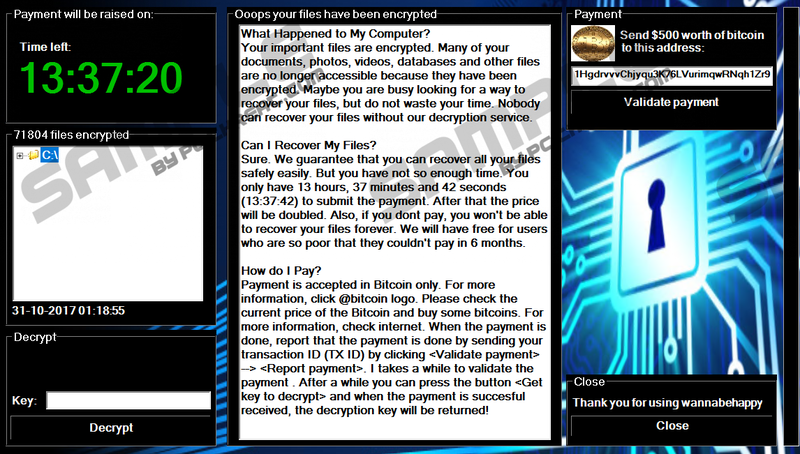 Furthermore, it urges you to pay a ransom in return for decryption services. Our malware exerts highly advise you not to abide by these demands because developers of this malicious program are not legally obliged to unlock your data even if you happen to make the payment of $500 using the Bitcoin cryptocurrency. Thus, you could lose not only your data but a large sum of money as well. To regain access to your files, we advise you to use your shadow copies or a backup image of your hard drive, provided that you have one. To remove WannabeHappy Ransowmare once and for all, make sure to use the detailed instructions that we provide below. Keeping your operating system safe and secure at all times is critical, to put it lightly. To improve your overall virtual security, we recommend practicing safe browsing habits. Since WannabeHappy Ransowmare like a lot of its contemporary counterparts is distributed via spam email campaigns, we urge you to avoid all questionable email attachments that are sent to you by unknown third-parties. It is also imperative to refrain from all unauthorized third-party download sites because they are infamous for hosting large numbers of bundled installers, which malware developers tend to use for distribution purposes. Furthermore, it is essential to note that cyber crooks often employ misleading and otherwise manipulative marketing techniques to trick naive Internet users into downloading and installing their suspicious programs. Therefore, you should always learn about an application that you are about to download before doing so since that could help you avoid a potentially dangerous setup file. While practicing such safe browsing habits will improve your virtual security, it is critical to also have a reliable antimalware tool since it can detect and delete any virtual threat before it can do any harm. By taking these seemingly simple precautionary steps, you will make your operating system virtually unbreakable. To remove WannabeHappy Ransowmare once and for all, make sure to use the instructions crafted by our malware experts. Be sure to execute each step with your utmost attention since a single mistake could result in an incomplete removal. It is not a situation that you want to find yourself in because leftovers of WannabeHappy Ransowmare could be used for its restoration. In other cases, those same traces might be enough for this malware to continue its devious functionality. To be sure that you have terminated WannabeHappy Ransowmare entirely, make sure to double-check your operating system for anything associated with this malicious program once you are done with the instructions below. Select a malicious registry entry called WannabeHappy and tap Delete on your keyboard. Right-click your Recycle Bin and the select Empty Recycle Bin. Quick & tested solution for WannabeHappy Ransowmare removal.